I’ve long been a believer in Marie Kondo’s philosophy that the items you surround yourself with should make you smile even before I discovered her book, Spark Joy, two years ago. Since reading it I’ve been interested to see how far this approach can apply to everyday items. Of course you can buy a beautiful chef’s knife or cast iron skillet that you take genuine pleasure in using, but what about something as functional as a dishwashing brush? Yes, even then you can find products that spark joy and the Redecker wooden dish brush, with its replaceable heads, embodies this philosophy beautifully. Plastic dishwashing brushes are ugly, the bristles melt in hot water and and after a few uses the the bristles flatten out rendering the brushes useless. At that point, it’s off to landfill for them where they’ll stay for years. A much better alternative is a wooden brush, and German company Bürstenhaus Redecker has been making them for 75 years. 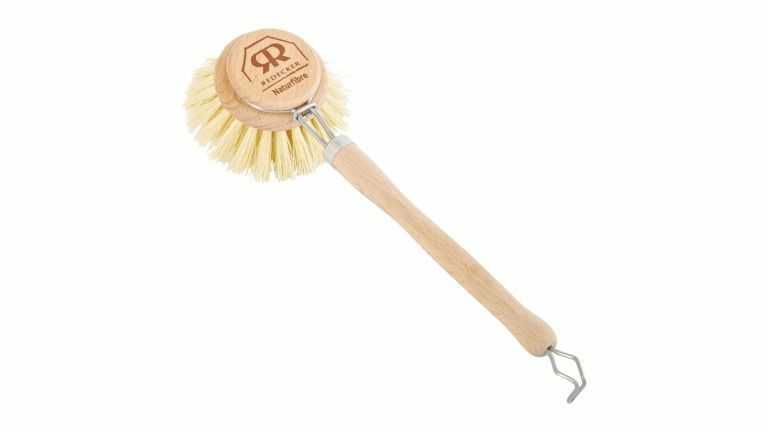 Its wooden dishwashing brush has a classic, functional design but it’s also a smart buy: the natural fibre bristles don’t go out of shape as quickly as plastic bristles and you can reshape the brush head while it’s wet. And unlike plastic bristles they won’t deform even if you’re using the brush in boiling water. What’s really neat about this brush – apart from it being made only of parts that are biodegradable (the wooden head and handle) or recyclable (the metal hanging handle and clip that holds the brush head to the handle) is that the heads are replaceable, so you don’t have to throw out the entire brush when the bristles wear out. When it comes to replace the head you can choose between brush heads that use horsehair bristles or ones that use natural plant (tampico) fibre. This makes the Redecker a cost-effective solution: a handle with three brush heads will set you back less than £15 and then you can pick up replacement heads for between £3 and £4 each. Aren't you just feeling a little more joyful about that sink-full of washing up already?